I congratulate Keira Gillett because her series only gets better. Not only are the characters growing with their adventures as we are as readers. As I mentioned on my previous review, this is definitely a story worth sharing with our family. 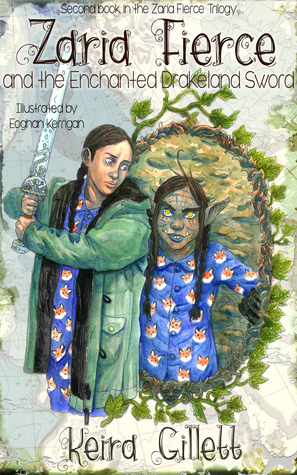 And if I had previously said that this series was a delight to Narnia and Spiderwick fans,I will consider The Enchanted Drakeland Sword as a potential children’s version of The Lord of the Rings. Hi everyone! I’m so grateful to be back at Ner’s wonderful blog. My name is Keira Gillett and I just published my second novel in the Zaria Fierce Trilogy. The trilogy is about a thirteen year old American girl who is transplanted to Norway and encounters the magical world when a river-troll kidnaps her best friend. I love the world of Zaria Fierce, which crisscrosses all over Norway. In Zaria Fierce and the Enchanted Drakeland Sword, Zaria and her friends learn more about the magical realms hidden from human view. There are so many things to see, to do, and to discover. I thought I would give a brief description of each of the places Zaria and her friends have visited or heard about in the course of their travels. Nicer map of #ZariaFierce world with glimpses into the adventure that is book two. Glomma – The Glomma is a river that bisects the city of Fredrikstad and is the home of a nasty river-troll named Olaf. It was somewhere along this river where Christoffer was held captive in Zaria Fierce and the Secret of Gloomwood Forest. Trolgar – The mountain-troll kingdom is hidden from humans. It lies deep underground and is formed from the cave system. The Wild Hunt is a tradition amongst these trolls. Don’t give them a reason to call one on you. Álfheim – This royal city is home of the elves. They’re located north of Trolgar and near their allies, the ellefolken. The city is built into the trees themselves and the walkways look like spun spider webs. They’re masters of illusions, so who knows exactly what trickery they’ve done to keep humans out. Under Realm – Not to be confused with the underworld, this magical void was the result of a great collaboration to imprison the dragons of the world. Why dragons? Because they are truly terrible and evil beings. Jötunheim – Is the region at the top of Norway where the sharp eyed observer can spot a giant. There are five tribes, three of which reside in Norway’s borders, the greatest of which is the Seiland Court. The other two Norwegian tribes are located even more northerly and touch the borders of Niffleheim and Jerndor. Niffleheim – Once upon a time Niffleheim was connected in many places to the world, but after the Vikings and the Dragomir Wars they cut off the world, except directly over their territory. Jerndor – As the High Court of the Dwarves, Jerndor is a gem of a city located just shy of Vadsø. They work closely with the southern dwarf society known as Malmdor to produce magical items from a special ore.
Malmdor – Not a very nice group of dwarves, they use slaves to run their mighty forges and furnaces. They also equipped a certain river-troll with chains to capture a young prince of the ellefolken. To learn more about these magical kingdoms read Zaria Fierce and the Secret of Gloomwood Forest and Zaria Fierce and the Enchanted Drakeland Sword. Or check out my website. Which kingdom is your favorite? Thank you, Ner! I’m excited to be here on release day. What a lovely review of the second book. I am delighted by your choices of realms to visit as I took great pleasure in writing them. I’m looking forward to taking readers deep into the Under Realm and even Malmdor for the third book.